Now that pasture growth and variability are known (procedure 8.1), you need to estimate your annual animal demand for the enterprises in your business. Flexibility with stock numbers during the year and between years is a key element of matching animal demand to pasture supply and managing risk. How flexible you can be with stock numbers will depend on your enterprise structure and goals, value of stock, disease risks if agisting or trading stock, and your willingness to conserve or purchase fodder and concentrates. Growth target: to gain or lose weight at a specified rate (kg/day). Information in Table 8.1 or the Grazfeed program can then be used to match pasture resources to feed requirements. Weaners and lactating ewes rearing twin lambs should get the best pastures, followed by single lambing ewes, pregnant ewes, hoggets, and then wethers and dry ewes. Directly related to the energy content-Metabolizable Energy (ME) of the pasture. Energy is needed by animals for body functions. Tool 7.6 in Grow More Pasture shows the relationship between the digestibility of temperate pastures and their energy content as they mature. Positively related to protein content. When digestibility is high, protein content will also be high, although pasture species vary in their protein content, eg, clovers are generally higher in protein than grasses. Directly related to the rate of feed moving through an animal. Pastures with higher levels of digestibility move more rapidly through the digestive system, allowing for greater intake and so greater animal production. Table 8.1 describes the pasture quality (digestibility) and quantity benchmarks required to meet production targets of various classes of livestock. Use the benchmarks in table 8.1 as “trigger points” to better match feed supply with animal demand and so improve the likelihood of meeting your production targets. Table 8.1 Minimum pasture supply benchmarks to maintain satisfactory production levels in sheep using herbage mass. For Feed on Offer, add 300kg DM/ha to the pasture targets. (Source: PROGRAZE® manual). * Predicted growth rates in brackets are based on a weaned 4-month old crossbred lamb of approximately 32kg from a ewe with a standard reference weight of 55kg. ** Add 300kg DM/ha to convert herbage mass pasture targets to Feed on Offer pasture targets. If the pasture targets in table 8.1 are not met, then animal production targets will not be met. A decision will be needed to accept a lower production level, change paddock, reduce stock numbers, or supplement to meet the energy and protein requirements of the stock. Tool 11.1 in Healthy and Contented Sheep lists the energy and protein requirements of a range of sheep classes. Tool 11.4 in Healthy and Contented Sheep can help you calculate the cost of energy and protein supplements to meet animal demand where pasture supply does not meet the benchmarks in table 8.1. At priority stages of the year (eg, joining, two months before lambing, lambing and managing weaners), use table 8.1 to set pasture targets for different classes of stock. Set targets for dead pasture at the end of the growing season. Using every kilogram of dry matter produced is not only unrealistic, it will quickly undermine the sustainability of your enterprise. Some pasture will always be trampled and fouled. A significant amount of pasture must remain uneaten to provide carry-over feed for stock, and maintain groundcover. Carry-over feed and groundcover are usually most critical over late summer/autumn, at the break of the season in southern regions and over summer in the north (see procedure 6.2 and tool 6.2 in Healthy Soils). Monitoring pasture mass every 1-2 weeks lets you identify and fill any impending feed gaps, or feed excesses that can be used. Tool 7.6 in Grow More Pasture and the MLA Pasture Ruler (tool 8.6) contain information to help you assess pastures. Plan how you want the pastures and stock to look throughout the year. An example is shown in figure 8.5 for a winter rainfall area but the principle is the same for all environments. Figure 8.5 Managing the risk of increasing pasture utilisation is all about planning ahead. Set targets, monitor and have trigger points for action when things deviate from your plan. Example for northern Victoria. Managing higher pasture utilisation is all about planning ahead (see figure 8.5.) Set targets, monitor, and have trigger points for action when things deviate from your plan. Setting targets for pasture supply and animal demand through the year gives you the decision framework for taking action if stock condition or pasture mass deviate significantly from the plan. Set condition score targets for mature stock and growth rate targets for lambs and weaners. Monitor stock at critical times during the year (eg, ewes at the end of spring, pre-joining and pre-lambing; rams pre-joining) to ensure you will meet your targets or can take appropriate action well before stock drop below their target score. Condition scoring is described in tool 10.1 in Wean More Lambs. Target condition scores for different classes of sheep are shown in tool 11.2 in Healthy and Contented Sheep. Trigger points spark action well before critical feed shortages. For example, if it hasn’t rained by a certain date, or pasture availability drops below your targets, you might change your weaning time, sell stock, purchase grain for ewes and weaners, or plan to use nitrogen and rotational grazing in order to boost pasture availability leading up to lambing. 2,695kg DM/ha is well above the November 5 target for the weaning paddocks. You may not need to lock up the paddock until the start of October (500kg DM/ha at the end of winter + 31 days at 45 kg DM/ha/day = 1,895kg DM/ha by 5 November). Feed supplements now (see procedure 11.1 in Healthy and Contented Sheep) and grow more pasture (see procedure 7.1 in Grow More Pasture). Accept a lower production level and potential damage to the pasture or soil base. Can you agist or trade extra stock now, or conserve fodder later? To meet all animal wellbeing requirements (see procedure 11.5 in Healthy and Contented Sheep). De-stock paddocks before groundcover falls to levels that expose paddocks to erosion (see procedure 6.2 in Healthy Soils). Put stock into another paddock where there is still adequate cover or, if this is not an option, put them into a containment area for feeding (drought lot). De-stocking will also prevent overgrazing and death of perennial grasses and so minimise the need for resowing. GrazFeed® can help you decide if the pasture in front of stock will meet their nutritional requirements. Being able to assess pasture objectively, in terms of quantity and quality is critical to making management decisions using GrazFeed®. 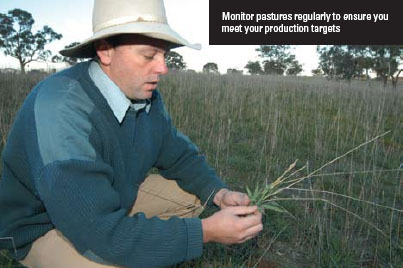 PROGRAZE® can help you develop objective pasture assessment skills (see signposts). Sowing pastures species (option 4) is generally a costly option, but can be very beneficial to address natural resource issues (eg, to increase groundcover, reduce salinity), production outcomes (eg, growing weaners) or when targeting new markets (eg, heavy weight lambs). The primary focus is to make better use of what is currently growing. Modifying animal demand by changing the annual livestock management calendar will help match existing animal demand to pasture supply. It may also highlight opportunities for increasing stocking rate, or a need to reduce stock numbers during periods of the year. It is more important to match supply and demand within seasons than for the entire year. This ensures animal demand is met and pasture resources are not degraded by over or under utilisation. This is the most important decision in the management calendar. Lambs provide a major boost to animal demand that can be aligned to peak pasture supply to increase total production and reduce risk and costs. Prime lamb flocks: lambing 4–5 months before the end of the reliable growing season gives a better result because it maximises the chance of finishing the lambs on pasture which is often the cheapest source of energy and protein. 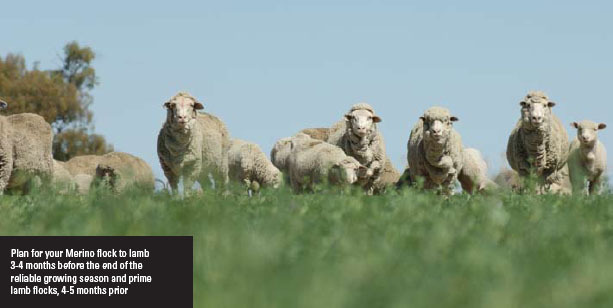 The AWI Lifetime Wool project has ewe management guidelines, tools and tips and background research results with economic analyses for sheep producers across southern Australia (see signposts). Many farms run sheep and cattle as well as a cropping enterprise. In such cases, the feed demands of the beef enterprise and the labour demands of the cropping program need to be factored in, which may alter the optimal time of lambing. Aim to sell surplus stock (culls, cast for age) when the stock are still in good condition. Typically this will be late spring–early summer in the south and later in the north. In a good year, delay stock sales to improve pasture utilisation and animal liveweight at sale. In a bad year, bring stock sales forward to reduce stocking rate and conserve feed for other stock. Similar flexibility can be applied to the timing of lamb sales and the target market, eg, feeder, finished or yearlings (see procedure 3.1 in Market Focused Lamb and Sheepmeat Production). Timing stock sales and purchases is a constant trade-off between current and expected future prices, and current and expected future feed supply. Decisions about timing of lambing and stock sales have an impact on shearing time. Timing of shearing can have important consequences for wool quality (see procedure 2.2 in Market Focused Wool Production), but it should be a secondary decision to time of lambing. Improving pasture use with the MLA Pasture Ruler: explains how to use the MLA pasture ruler ( tool 8.6 ) to estimate pasture mass (quantity) and quality and the performance you can expect from your grazing animals. The MLA EDGEnetwork® program is coordinated nationally and has a range of workshops to assist sheep producers.